Jo’burg was never short on character, although that wasn’t always a good thing. Now, South Africa’s largest city is once again on the up, with its crime rate on the down, and is enjoying a newfound popularity with tourists. At the heart of this regeneration is a spruced up Central Business District, and the rise of hip, artistic precincts like Braamfontein, Newtown, and, our favourite, Maboneng. Maboneng is the gravitational centre of Jo’burg’s thriving cultural scene, drawing in the cool, the creative and the freethinking from throughout the city. The ruined warehouses and run down apartments that used to typify the city have been converted into stylish modern living spaces, studios and eateries. Limited space has led to creative interior design solutions and buildings being used for multiple purposes, while any available street space is used to sell souvenirs, street food or clothing to the diverse crowds that flock by. The result is a shining example of urban living that truly deserves its name – Maboneng is an old Sotho word meaning ‘Place of Light’. 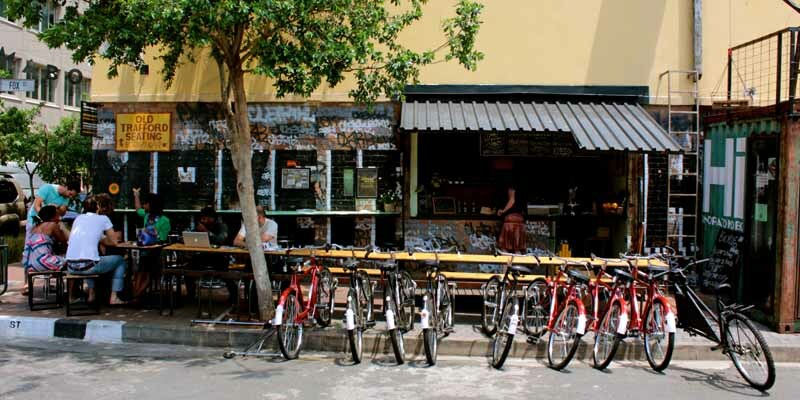 Locals are embracing quirkiness in all its forms backpackers love the Brooklyn-esque vibes and the close feeling of community that Maboneng fosters. If there’s any area of Jo’burg which epitomises the success of its urban regeneration, Maboneng is it. As the hipster hub of Jo’burg, art makes its presence felt wherever you go in Maboneng. Out on the street murals adorn the walls, and a walk along Main Street takes you past many small, independent art galleries sandwiched between the busy cafés frequented by skateboarding locals. One of these is Arts on Main, the project that originally gave birth to Maboneng, first as a concept, and then as a precinct. The place is much more than just a gallery, mixing studio space with exhibitions, fashion outlets and trendy office space, but art and creativity are core to its being. Everything worth knowing about Jo’burg’s art scene can be seen, or at least heard about, here, and there is a massive warehouse full of local artwork and sculptures open for free public viewing. The development is also home to many local artists, including David Krut who showcases his modernist and surrealist sculpture, and the Jozi Art Lab, which brings together different artists from every conceivable background. One of the most inspiring exhibitions is I Was Shot in Joburg, a photography project that brings the city’s at risk and disadvantaged youth into contact with photography and gives them a platform to display their work. A single block further along Main Street brings you to the Chocolate Ink Gallery with its focus on fine print art, which runs intensive beginner courses for those lucky enough to stick around for at least six weeks. Plenty more cool galleries are waiting to be discovered in the district, but before you set off adventuring make time to check out Market on Main, which takes over the area every Sunday afternoon. Sip on a cup of Ethiopian coffee, pick up a roti wrap or try some traditional South African cuisine (the local craft beers are especially great). Like the rest of Jo’burg, Maboneng’s multiculturalism is one of its greatest assets, and you can find everything from find Indian dishes to Italian pizzas at the market. It isn’t all about food either; you can also pick up the latest fashions at knock down prices and even find speciality items like handmade furniture (although we aren’t sure how you will get larger items home). True to Maboneng’s inclusive philosophy the market plays host to every strata, every age and every ethnicity of South African society – proof of just how far Jo’burg has come in such a short time, and how bright its future is. There’s way too much to see in one day, and rushing isn’t the way to see Maboneng anyway, so you’ll be in need of an overnight halt, giving you a choice of hostels, hotels and apartments in one of the many converted buildings. Curiocity Backpackers is an art hostel that offers both dorms and urban camping on the rooftop, making it an imaginative and unique budget experience, and the sunset from the roof in particular is simply majestic. A more upmarket option is a night at 12 Decades Hotel, an imaginative hotel which fits the vibe of the precinct perfectly. Each room is themed around a different decade of South African history and there are art galleries on each floor, summing up the creativity and innovation that Maboneng is all about. It also happens to occupy the same building as Bioscope, Johannesburg’s only independent cinema, which shows everything from local art films to international blockbusters. The Maboneng Precinct has been at the heart of Jo’burg’s rebirth, putting this fantastic city back on the map as a tourist destination. It’s philosophy of inclusiveness and innovations in modern living have contributed to the increasingly safe feel of the city and shown the world that South Africa has a cultural scene to rival the best. Maboneng, we salute you.